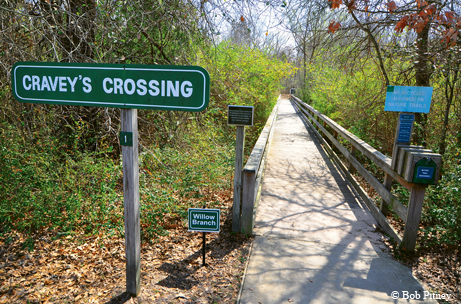 Catch your first fish or sail through the treetops in deep East Texas. My roots in Athens run deep, but somehow I’ve visited only a few times. My ancestors settled nearby in 1851, on land still occupied by descendants. More recently, my grandparents lived down the road in an oilfield camp. I’ve been eager to spend a long weekend learning more about Athens and my family history. Athens is 75 miles southeast of Dallas in the post oak savannah, a region of Texas originally characterized by tall hardwood trees and bunch grasses, creeks and bogs. Fire and buffalo helped shape the region’s landscape. Settlers thought the area looked ideal, and began harvesting timber, plowing meadows, grazing wild areas, damming creeks and rivers and suppressing fire. The region was irrevocably altered. Still, pockets of wild lands remain near Athens. My friend Lona and I arrive in town on a lovely fall afternoon. Our first destination (after the visitor center on the square) is the East Texas Arboretum and Botanical Society, a 100-acre property inside the city limits. The abandoned truck farm was reclaimed in 1993, and the property features two miles of nature trails that allow visitors to wander through the woods, past a bog and across a 115-foot suspension footbridge. Lona likes to run on these bouncy bridges, so she makes a few passes while I snap photos. She identifies dogwood, hickory, water oak, post oak and southern red oak trees. Leaves turning autumn colors and American beautyberry with its striking magenta berries make this a colorful place. We agree the trail would be equally lovely in spring, with dogwoods and wildflowers blooming. We tour the Wofford House, a beautiful dogtrot cabin built in 1850 and moved here in 2001. It’s been authentically restored, complete with period furnishings. Next to the house is a vegetable garden, duly guarded by the requisite scarecrow. We stroll to a lovely demonstration garden, overflowing with colorful flowers, shrubs and grasses. Paths wind through, and a small bridge arches over a dry stream. The children’s “play garden” has a unique slide set into a hill, butterfly gardens, water features and small buildings (including a little red schoolhouse) for exploration. We leave this area to the exuberant children playing there. I wish I had tried the slide, though! It’s dinnertime, and we know what’s on the menu. According to local lore, native son Fletcher Davis invented the hamburger at his lunch counter, and introduced it at the 1904 World’s Fair in St. Louis. His counter is no longer here, but we find another restaurant serving burgers, and they live up to the legend. On Saturday morning, we mosey around the town square before visiting the Henderson County Historical Museum. In 1896, my great-great-grandfather commissioned the construction of this two-story brick structure. When completed, the building housed a grocery and law offices. Now the museum displays local memorabilia and a replica dry goods store downstairs, with a law office, schoolroom, parlor, kitchen and more upstairs. The museum is open Fridays and Saturdays, 10 a.m. to 3 p.m. (upstairs tour by request). Lunch finds us perched on a stack of bricks at the Athens cemetery — a first-time experience for both of us. Despite the somewhat ominous cawing of a crow overhead, it is a peaceful, relaxing place. We have tracked down my ancestors’ graves, and I draw a family tree as we eat. Now it is time to shift from the past into the present. Our next destination is the Texas Freshwater Fisheries Center, operated by the Texas Parks and Wildlife Department; we arrive just in time for the 2 p.m. dive show. The center supports and promotes freshwater fishing and is home to the Toyota ShareLunker program, in which anglers lend or donate their 13-pound-plus largemouth bass catches for spawning purposes. At the show, a TPWD technician immersed in a large aquarium talks about the fish swimming around him — largemouth and smallmouth bass, and the dramatic alligator gar. The diver tells us what each type of fish eats, as he dispenses food. After the show, we head outside for an open-air tram tour of the fishery. A guide describes the fishery’s operations as we pass a warehouse with long blue spawning tanks and then pass outdoor ponds where fish grow to fingerling size before being released into the wild. Lona and I opt to disembark at the farthest point and return via the 0.8-mile, ADA-accessible wetlands trail. Along the way, we check out the animal sounds station, look for tracks imprinted on the concrete trail, visit the bee house and identify native flora, including pitcher plants. Pitcher plants are carnivorous, obtaining nutrition from insects lured into their tube-like leaves. Once trapped inside, insects drown in water accumulated there and subsequently decompose into plant food. The trail ends at the center’s casting pond, where visitors can fish for free, with equipment and instruction provided. Many families are here this afternoon, trying their luck. 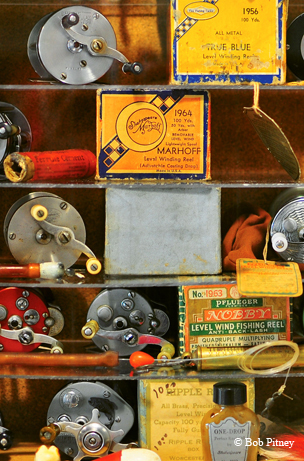 More than 60,000 people visit the center annually; half spend at least a few minutes fishing. About 500 of those catch their first fish here, says Larry D. Hodge, the center’s information specialist. The pond is primarily catch-and-release; but for $10, an angler may take home five catfish. Lona heads for the gift shop, while I explore the aquariums showcasing native fish and an exhibit containing two large alligators. At the catfish exhibit, a family drops food into the pond, and then watches the ensuing feeding frenzy through a glass wall. They remind me of movie piranhas! 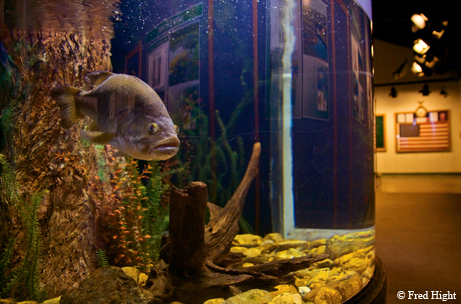 Allow time to explore the center’s Hall of Fame and Texas Record Fish Exhibit, as well as the Hatchery Gallery and ShareLunker Overlook. We are apprehensive about our next activity: soaring through treetops at New York, Texas ZipLine Adventures. However, we are of an age when we must prove we are still adventurous, and the view should be worth the jangled nerves. Several years ago, the Shultz family watched a television show about a Costa Rican zipline. Connie Shultz says they thought it would be a great way to share the view from their hill. Husband Charles, by day a house mover, researched and then built these ziplines with his family’s help, and they began offering tours in April 2008. After equipping us with a helmet, gloves and harness, son Carson Shultz takes our group to ground school, where we hook on to a low zipline and learn how to slow down. He says we’re ready to zip. We climb up stairs to a platform, from which the first short line departs. Did I mention I’m afraid of heights? Carson, however, is a master of small talk and calm reassurance, and the harness seems securely attached. I settle into it and off I go! By the third or fourth platform, as the lines increase in length and height, we feel more confident and the joking begins. Carson shares some official zipline terminology with us, but you’ll have to learn that firsthand. The sixth zipline is the big one — over 900 feet long, and 100 feet above the ground. Yikes! But Carson assures me, “You’ve got this,” and I do. I have time to look around and enjoy the view. Surprisingly, I’m not scared as I soar above trees, looking down on a pond and out to the horizon — it is exhilarating! While some of our group continues on to three more lines, most of us walk back to the house to divest ourselves of gear. We’re giddy after our adventure, but it’s time to return to earth. On Sunday morning we pack up and head south to the Gus Engeling Wildlife Management Area. The property (nearly 11,000 acres) was purchased by the state in the 1950s. It was grazed but not extensively cleared, and therefore provides a good example of the historical post oak savannah. Visitors may take the driving tour and hike the trails for free. To wander farther afield, adults 17 and older must possess either a hunting permit or a limited public use permit. Camping is available in several locations. We veer off the main road onto a dirt track. After parking, we don our hunter orange vests (squirrel and wild hog hunting are allowed) and set off. Birds are everywhere, and Lona puts her new binoculars to good use. She points out a brown thrasher, which I’ve never seen, and three types of woodpeckers. We’ve been here an hour and seen no other humans. We return to the car and drive north to the mile-long Dogwood Trail. There we hike past dogwoods and other native species, stopping to admire a small creek. Next, we drive on to a viewing blind perched over a pond where we spot our first critter — an armadillo. At my approach, he jumps, snorts and runs away. The trail here is closed because of flood damage, so we continue north to Lake One. A man and two boys fishing offer us their canoe so we can hunt for alligators. I picture myself swimming with alligators — and quickly say “no, thanks.” After a picnic, we reluctantly leave this peaceful place and turn toward home. Athens offers many more activities than can be experienced in one weekend. 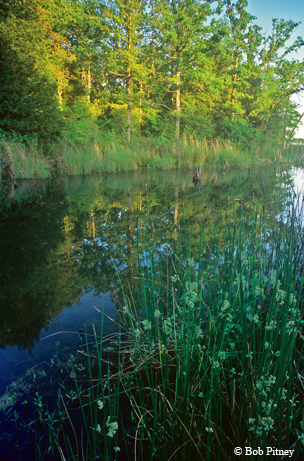 Purtis Creek State Park, 15 miles northwest, provides camping and fishing, as does Lake Athens Marina. Other lakes are nearby. Athens Scuba Park features 70 feet of underwater visibility and interesting structures to explore. Even if your family isn’t rooted here, Athens is a fun-filled destination. People are friendly, colorful scenery beckons, and the recreational opportunities are myriad.